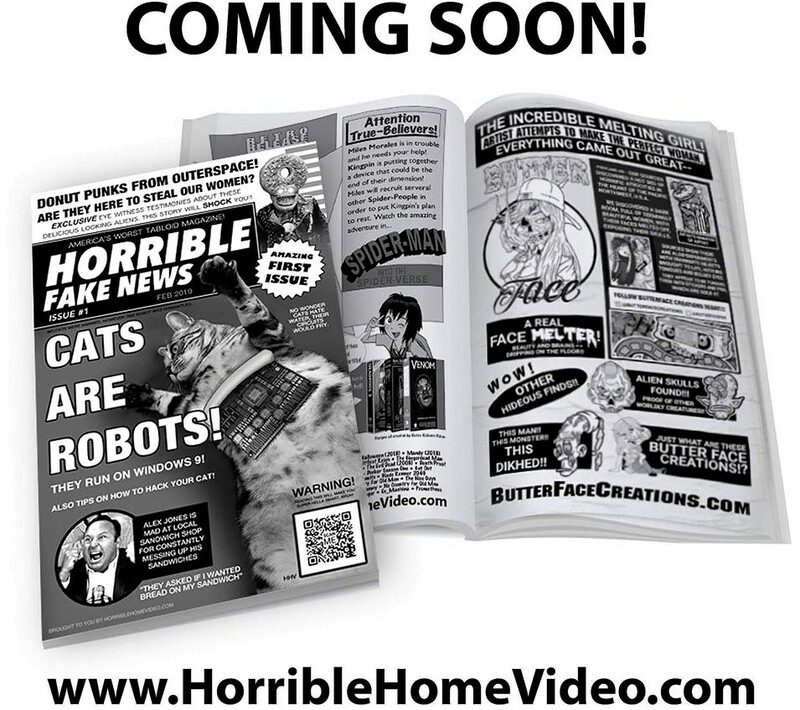 Horrible Home Video specializes in horror merchandise that oozes from the mind of owner and artist Justin Parker. With over a decade of experience in creating and producing high quality prints, the company offers buyers top notch merchandise at fair prices. 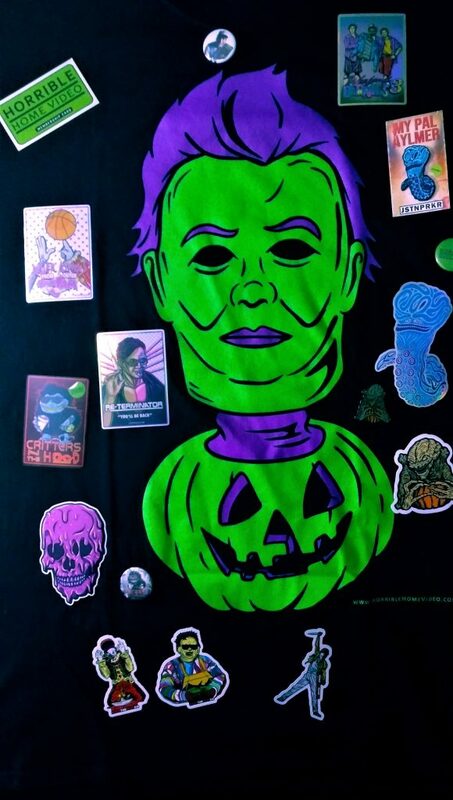 One particular horror related goodie that is sure to catch very horror fanatic’s eye, is the ghastly original apparel art – T-shirts splattered with Parker’s retro-themed art. Now you can fly the colours of films from the late ’80s / early ’90s, that time when one could walk down aisles of the local video store and bask in the unique cover art from classic films in VHS and Beta formats. Then there’s THE OFFICIALLY LICENSED STREET TRASH T-SHIRT which is set up expertly like a comic book page, except it yells a story using Street Trash illustrations and conversation bubbles. 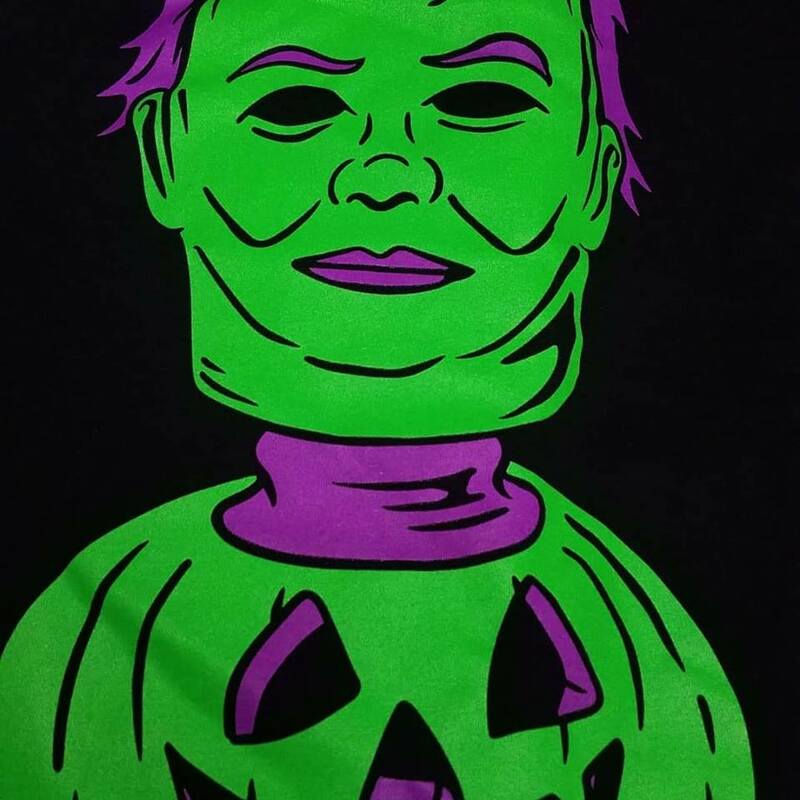 If you’re more keen on colour, take THE MYERS STALKS T-SHIRT which transforms Michael Myers’ well-known Halloween mask and adds green with purple hair (a nod to The Joker from the Batman storyline?). IN Parker’s hands, the mask seems as if it’s just popped out of the ghastly green pumpkin, not unlike the “Jack in the Box” toy. One might also notice that each one of these shirts have Japanese phrases worked into the graphics. Horrible Horror Video has also launched a pre-order for its 精神遅滞vs愚かな人 T-SHIRT AND LONG SLEEVED SHIRT. Using a 3 color discharge silk screen print, the fictional character Ernest P. Worrell meets the fictional Killer Jason Voorhees in spoof of this retro-themed release. 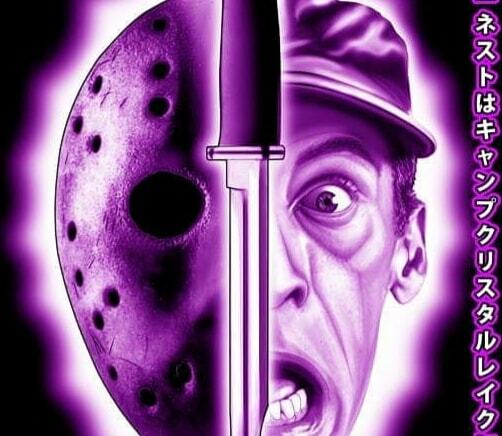 The purple image of Ernest and Jason come together to form one exciting mash up of a comedy hero against a horror icon. 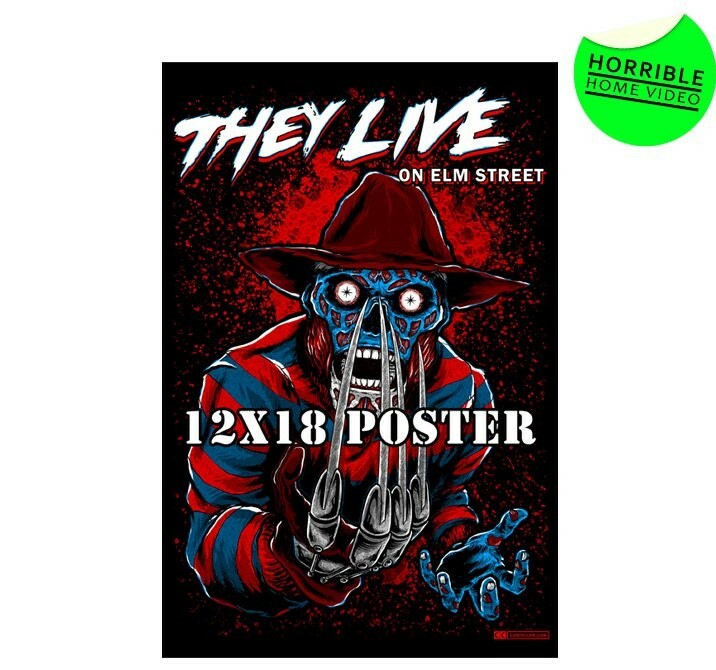 Complete with old horror video store sticker and tagline “Ernest is about to find out that Jason doesn’t know what he means, Vern”, this design is sure to please most film fans of either franchise. Keep an eye out for upcoming Jason X and Nightmare on Elm Street Shirts releases. If shirts aren’t your fancy, don’t have a cow man! 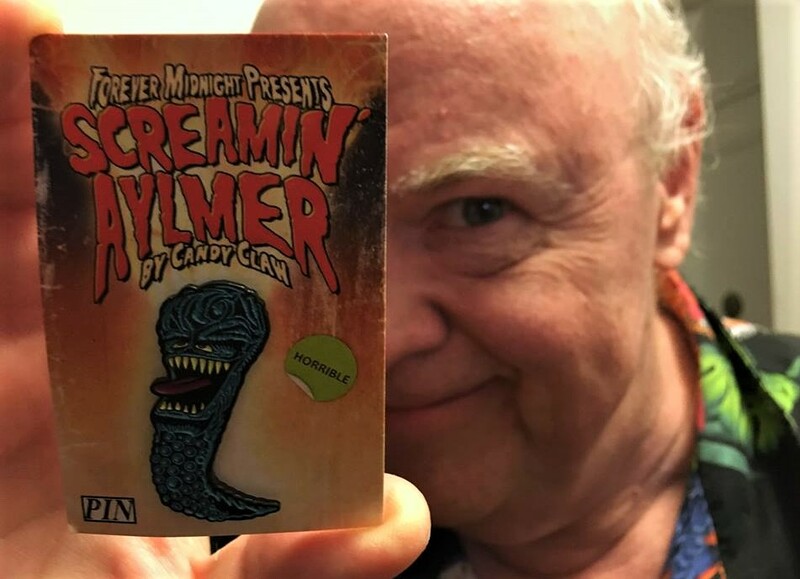 Horrible Horror Video also produces stellar enamel pins; take a look at this “MY PAL ALMER” ENAMEL PIN AND STICKER SET, straight out of the film Brain Damage. This 2-inch soft enamel pin is limited to 100 made and comes housed on a display card that resembles the Brain Damage VHS cover. 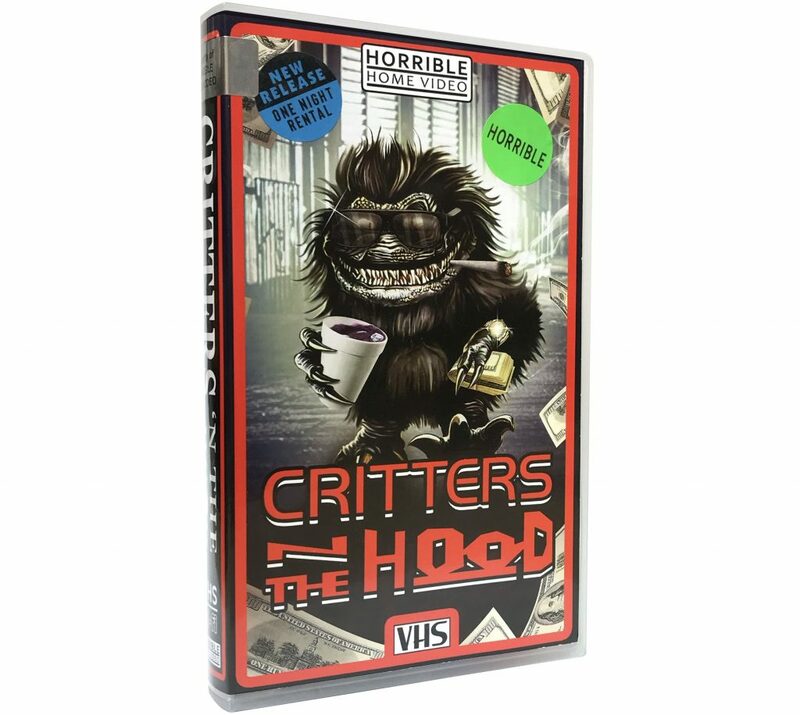 Check out more in stock and available items on Horrible Horror Video’s website or on the Instagram account below.